Abandoned Little Treasures is the latest in a series of how-to books on the subject of abandoned or derelict vehicles and aircraft. 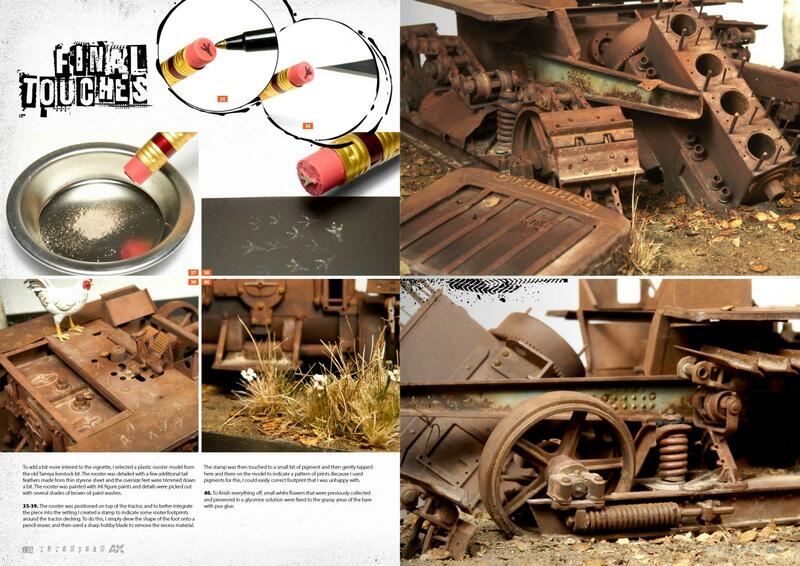 The detailed steps that the various modelers used to achieve their end result will amaze and delight. ( Not to mention putting my modeling skills to shame.) The subjects covered and the finesse utilized by the different contributors I found to be just exquisite. These are first-rate modelers at the height of their craft. But having said that, each one has included detailed, easy to follow step-by-step processes that the various modelers used to achieve the desired effect. This tutelage is accompanied by loads of high-quality photographs that illustrate each step beautifully. One article that I was most fond of is of the IJN carrier Amagi at Kure Harbour, 1946. The ship lie at anchor when it was bombed and the diorama depicts the Amagi in its twisted and tattered state as it awaits salvage. The level of detail is outstanding. As an example, the modeler thought to show the tire tracks of some support vehicles no longer present. It really is the little things! There is also an article of an air compressor. You will be hard pressed to believe that it is a paper model! The article on the construction of a rail station structure further illustrates the diversity of materials used throughout this publication. The rail station is made from foam core board. There are loads of reasons to enjoy this book, over and over again. One fun thing with writings that include non-native English speakers/writers is the different syntax and phrasing that software translations give to these types of publications. It can make some of the photo captions a bit difficult to follow but you'll figure it out. It may require you to re-read different sections to get the authors idea. That will be time well spent as there a lot to absorb from this book. All photos from the AK Interactive website. My thanks to AK Interactive and IPMS/USA for the review copy.